My last post was inspired by Hamilton. This one is inspired by The Flick (directed by Sam Gold, currently remounted with its original cast at the Barrow Street Theatre). Or rather, this post is inspired by the radically different pacing that’s exhibited by these two shows and the question of how timing effects storytelling. Both of these shows are on the longer side. Hamilton was running around 2 hours and 45 minutes when I saw it. The Flick ran around 3 hours in it’s previous run at Playwright’s Horizon. (Although, it was 3 hours and 30 minutes when I saw it at Barrow Street, which was during previews. So perhaps they are in the process of tightening it up.) I would wager that Hamilton squeezes in at least double the volume of words that The Flick does within that roughly 3 hour period. Hamilton is an ever singing, ever moving roller coaster. The Flick is a slow burn of sparse language and even sparser action. Stylistically, I don’t know if these shows could be more different. Yet, in theory, the goal remains the same – tell the story at hand with the greatest emotional impact possible. As a general rule, I believe that lines should be delivered as quickly as possible while maintaining the integrity of the story. I believe that we should speak at the speed of thought (which tends to be pretty fast) and that pauses should be earned. As such, The Flick was a challenging piece for me to sit through with its massive gaps between sparse exchanges of dialogue. And while it was well executed by the performers and achieved the Chekhovian effect of making ordinary interactions poignant, I couldn’t help but wonder if all that time was really necessary. Because I’m really not sure that it was. I feel conflicted saying that. As I read various articles about how technology is shortening our attention spans – how musicians are having their instrumental interludes gutted in order to be played on the radio and the acronym TLDR (to long, didn’t read) haunts articles that take longer than 60 seconds to read – I feel determined to retain my ability to focus in concentrated blocks of time. But at the same time I have very little use for theater that is described as being best for “serious theater goers” (as reviews from The Flick‘s initial run hearkened to). If our audience has to work to stay engaged with our story, maybe we need to adapt how we’re telling it. I genuinely don’t know what the answer to this is. I would love to know, from a scientific standpoint, how time – specifically the gaps between cues – effects perception of the story. This is clearly the issue at hand for film editors all the time. But I would love to see a controlled experiment where the pauses between lines were systematically shortened to test whether or not the scene could be as effective in a shorter amount of time. Much like the way researchers test whether people make higher donations after receiving appeals letters written in blue on black ink. Until then, we’ll have to continue to feel it out. I’m thrilled to be performing in a second round of You’ve Got Apples, this time as part of Musical Theatre Factory’s 11th Round of 4×15’s. 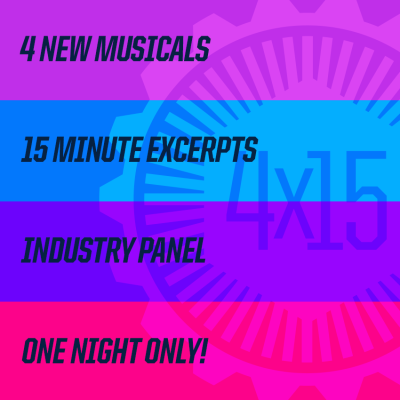 One night only – Monday, May 18th at 8pm at The Factory. Tickets are $12 in advance and can be purchased here. Come and join us! This weekend, I had the pleasure of joining Young Playwrights for a staged reading of work from their Advanced Playwriting Workshop. And while this performance has sadly passed, they are a fantastic organization with buckets of talented, awesome people. You should definitely check them out.